So, having got my Raspberry Pi/RuneAudio setup in place, I started looking at my audio system as a whole, and wondering whether there were any other aspects of it that were worth upgrading. I’ve had my hi-fi for over 15 years: it was, I think, my 18th birthday present from my parents. It had served me well over the years and still sounded pretty good using the speakers that came with it. However, it had some limitations. The remote control had stopped working some time ago. The Minidisc player was now essentially obsolete. I no longer had an aerial for the FM radio and it didn’t support DAB. With my CD collection now mostly absent, the usefulness of the CD player was now greatly reduced. So it was essentially just acting as an amplifier for the devices plugged into the two external inputs: my RPi, and a Bluetooth receiver that I mostly left unplugged anyway as it had an annoying blue light that flashed when it wasn’t connected to anything (which was most of the time). With this in mind, I wondered whether I wouldn’t do better to replace it with a dedicated amplifier. If I were certain that I wanted to do away with all audio sources except the RPi, then getting a single-source digital amplifier would only cost around £50. There would, however, be no way to control it remotely, although for volume I could use software controls on the Pi. But more importantly, I wasn’t certain that I wanted to completely abandon CDs and radio. 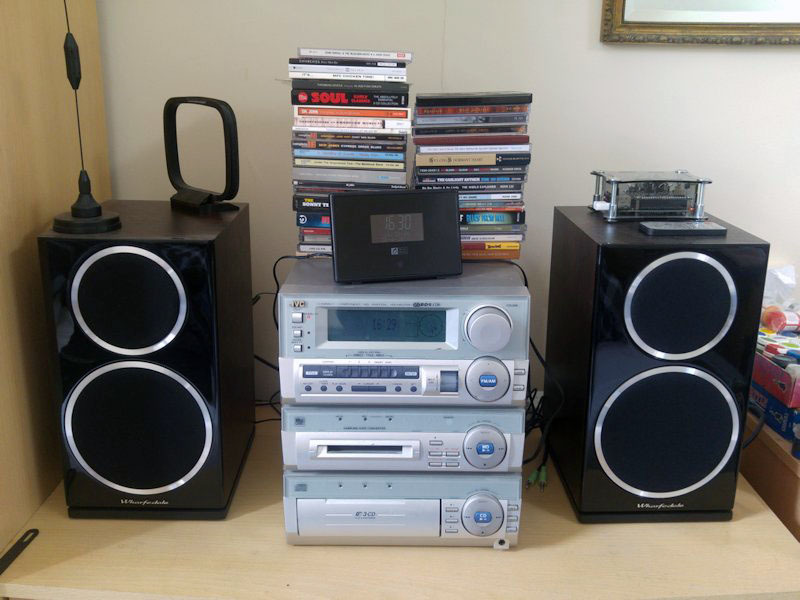 If I wanted an amplifier with multiple inputs and remote control, the cost suddenly went up quite a lot, plus if I did want a CD player and/or radio, those would cost more. Since I couldn’t get a set-up that really represented any kind of upgrade over what I already had for less than £300, I decided not to bother. I would keep the core of my existing hi-fi. However, I was still keen to try adding on or replacing other parts to improve the sound and/or restore or add missing functionality. It’s worth mentioning at this point that there is a huge amount of utter nonsense floating around the world of audio enthusiasts. Believe everything you read and hear, and you could easily justify spending extraordinary sums of money on equipment that cannot possibly achieve what is claimed without using magic. This article provides a brief, well-referenced summary of the most widespread myths that abound on the subject. It’s worth noting in particular the section on well-designed amplifiers all sounding the same. This was a factor in my decision not to replace the core of my hi-fi. 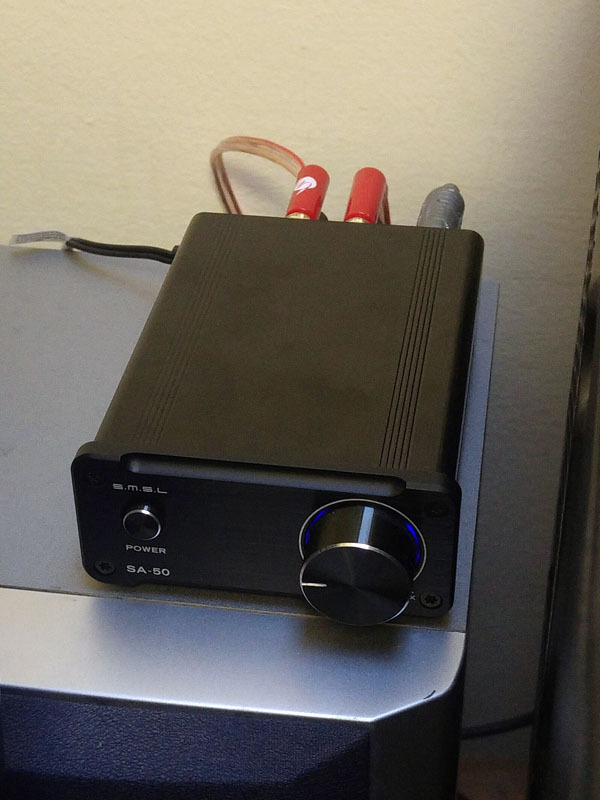 The amplifier sounds fine to me; it has more than enough power to drive my speakers at louder volumes than I will ever need, without any audible noise or distortion. 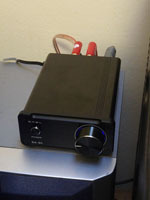 If amplifiers did indeed all have their own sonic signatures, there might be some reason to replace it, but since they do not (ignoring very expensive specialist amplifiers which may well have a distinctive sound, as I see no need to pay extra for an amp that reproduces sound less accurately than a cheaper one), there is none. One upgrade that did make some sense was to replace the speakers. There isn’t anything particularly wrong with the speakers I already had, but I suspected that I could get some benefit from a better pair. Following some research, I eventually concluded that the best speakers I could afford were a pair of Wharfedale Diamond 220s. They do sound very good. I haven’t done any proper blind listening tests, but I do think they are an improvement over the old speakers; in particular the bass is a little clearer and more detailed. That said, the improvement is pretty subtle. The old speakers did a good job already so without spending crazy money I wasn’t going to get a huge improvement. If I want to improve the sound quality further, I could probably experiment with positioning the speakers better. In all honesty their current location isn’t ideal unless I’m sitting opposite them on the bed, which I almost never am. I also decided I wanted to have the option to listen to the radio again. The RPi setup can stream Internet radio, but with a perfectly good FM receiver it would make more sense to use that where available. Buying a new VHF aerial was all I needed to restore the radio to working order. 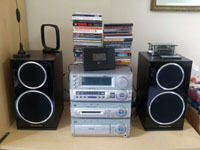 However, I also wanted to be able to listen to DAB broadcasts (especially Radio 6music). This would require additional hardware. I eventually got an Ocean Digital DBA-01B, which in addition to receiving digital radio (including DAB+ in case that is ever introduced in the UK) could also act as a Bluetooth receiver. Since I only have two external inputs for my hi-fi, I would have to remove the Bluetooth receiver I already had, so having this feature on the new device was a plus. Even though I don’t use it very much, it was nice to keep it as an option. At this point my hi-fi setup is complete. It now does everything I want it to do and sounds great. I did still have one more thing to get, though. I now had a spare pair of good quality speakers. They weren’t much use on their own, but with the addition of a small amplifier, I was able to hook them up to my computer, where they represent a vast improvement over the fairly basic pair of Logitech speakers I had before. Since the amp is small and portable, this also means that I can take the speakers downstairs and hook them up to a laptop, phone or portable player for parties etc.